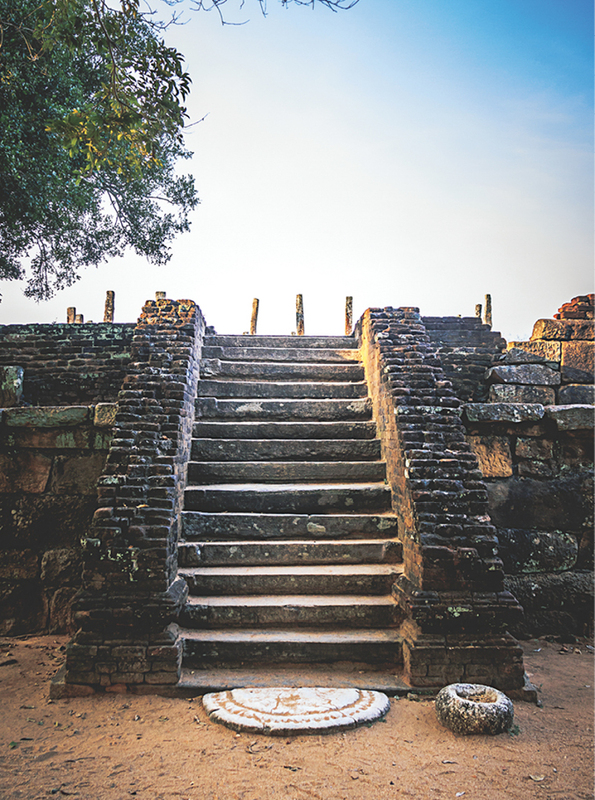 Built on the site of the ancient, and now lost, Mandalagiri Viharaya, the Medirigiriya Vatadage and its attendant buildings belong to a very distinct Buddhist monastic architectural style. As such, the Medirigiriya Vatadage is one of the three best preserved examples of Vatadage in Sri Lanka, and is certainly the oldest of them. 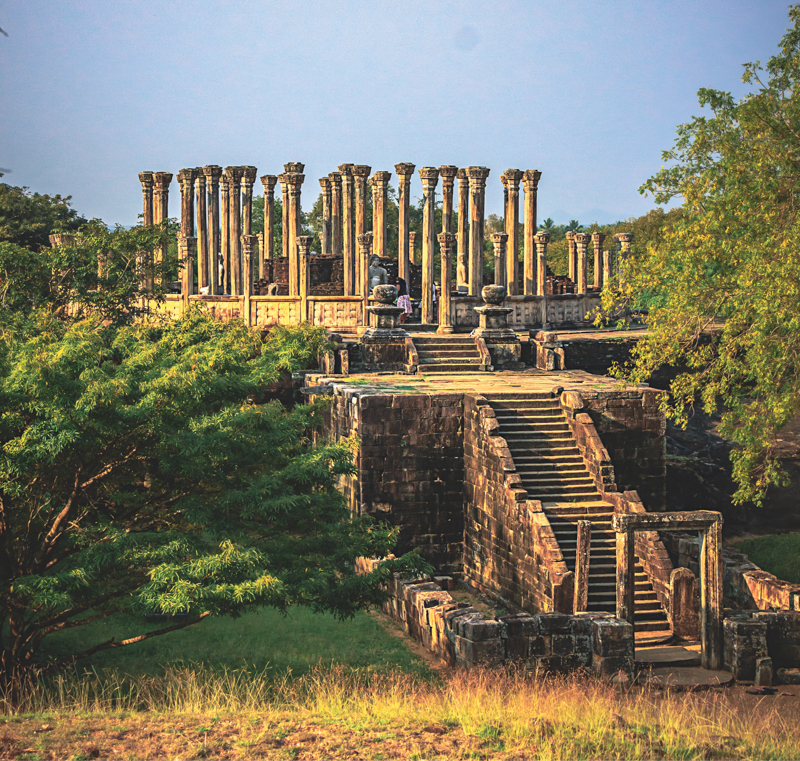 Located as it is, approximately 30km north of Polonnaruwa, one might be forgiven the belief that Medirigiriya belongs to the Polonnaruwa Period of Sri Lankan history. However, the vatadage at Medirigiriya is considerably older, believed to have been built by King Aggabodhi IV, in the late seventh century. 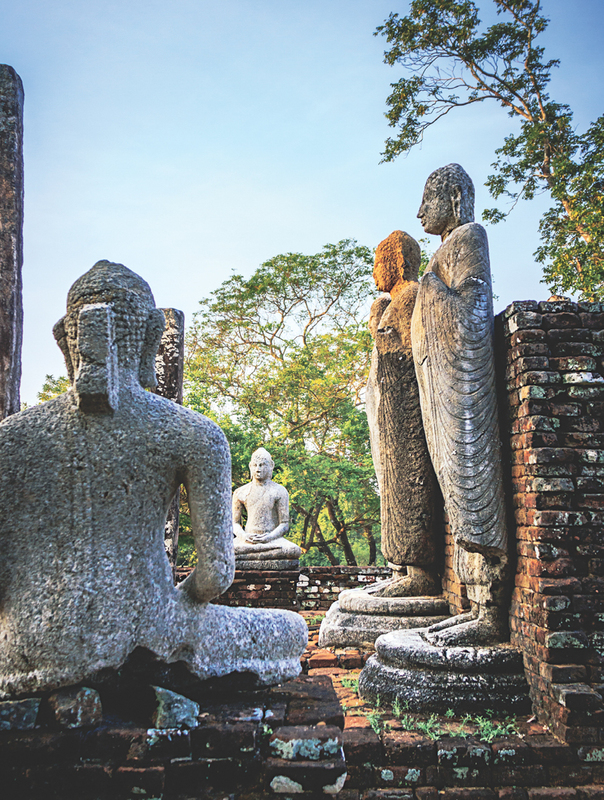 The Medirigiriya complex consists of the vatadage - literally translated as "circular relic house", four image houses with a collection of granite and limestone Buddhas of varying degrees of wear, and an older brick stupa of indeterminate age. To the northeast of the complex is the ruin of an ancient hospital, though it is unlikely that the latter had any connection with the main Buddhist site. 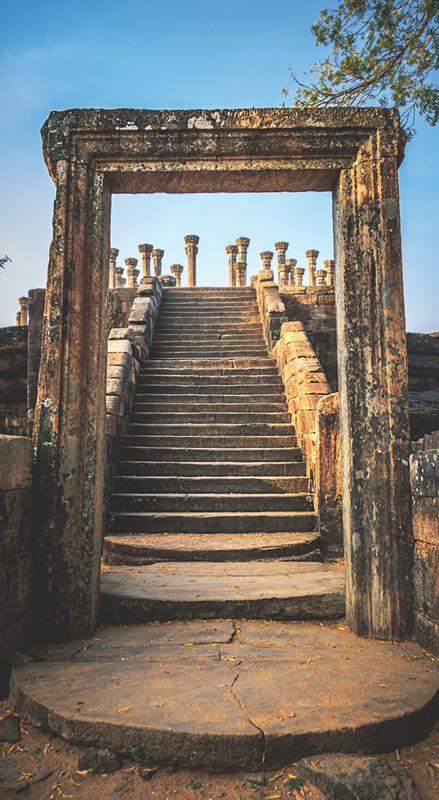 Medirigiriya is built on three levels, on an east-west axis, and several steps bring one up to the first level. 50m on is a taller flight of stairs, which is the main entrance. At the top of these steps, standing stone columns are all that is left of what was possibly a residence of some sort. From here, the footpath runs almost due west for 100m, bisecting two large rock formations before culminating at what is locally called the Pichcha Mal Viharaya; an image house within which are five granite Buddhas; three standing, flanked by two seated at right angles. The rock formations on either side of the path form the complex's third level, and on top of them are several structures. On the northern - taller - rock, is a brick stupa believed to be older than the other Medirigiriya ruins. The earliest reference to the site is as the Mandalagiri Viharaya; the Mahavamsa recording that King Kanittha Tissa built a chapter house here in the second century. If the brick dagaba is from that period, there is nothing to indicate it. A shallow flight of stairs is cut directly into the rock, leading up to its crest. This is the highest spot in Medirigiriya, and affords an excellent view of the opposite rock and the vatadage, which occupies the next-highest spot. This is the highest spot in Medirigiriya, and affords an excellent view of the opposite rock and the vatadage, which occupies the next-highest spot. The rock slopes gently west, with three image houses arranged in a row along its ridge. Unlike the rough steps cut into the northern rock, the vatadage is reached by walking through a free-standing stone doorway and up two beautiful flights of stairs, each with 14 steps, fashioned out of the same granite blocks as the rest of the temple. With its steep stairways, broad surrounding platform, and multiple levels, the temple is reminiscent of Maya and Aztec architecture, though far less elaborate. As a dage, or relic house, the Medirigiriya Vatadage would have been most likely built to enclose a holy relic, itself enclosed within a stupa. Some vatadages, however - like that at Mihintale - were built on hallowed ground, probably to enclose an already existing dagaba. Whatever Medirigiriya's purpose was, the small stupa within its vatadage is hardly recognisable; its softer brick having fared less well against the elements than the granite of the vatadage itself. The stupa is surrounded by three rings of stone columns. The inner ring of 16 columns are 17ft tall. The middle ring of 20 columns is 16ft tall; and in line with four limestone seated Buddhas, facing the four principle directions. Between the middle and outer rings are the remains of a brick wall which, like the stupa, has deteriorated. 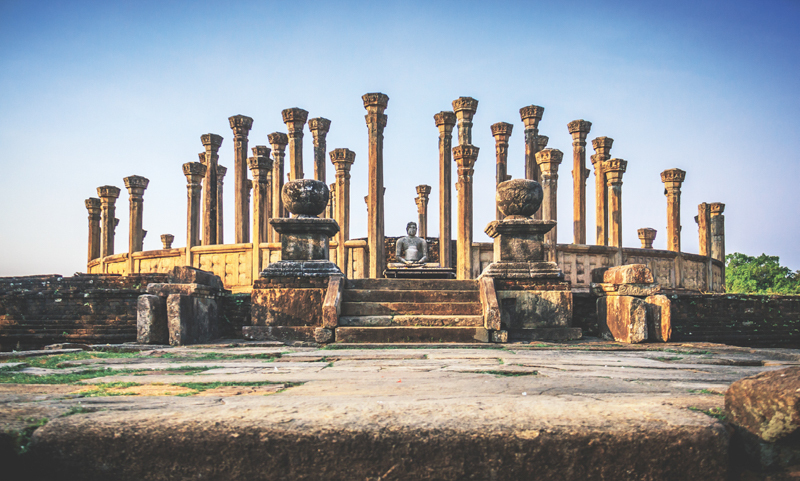 It is possible this wall, like that of the Polonnaruwa Vatadage, once rose as high as the columns, and was decorated with paintings. 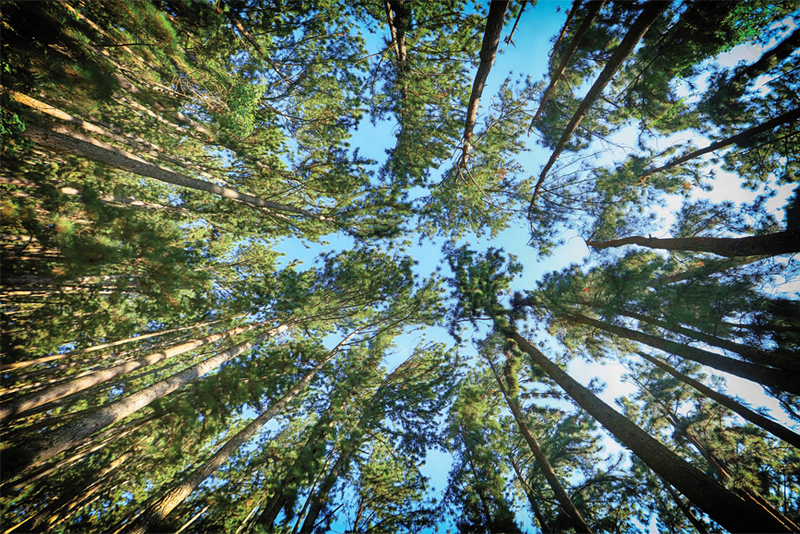 The outer ring of 32 columns are only 9ft in height, indicating that the columns once held a dome-like or conical wooden roof. A lower wall - this one of stone, and crafted in a post-and-rail design - encompasses the outer ring. The height of the columns is an indication of how tall the stupa probably was; since it had to be enclosed by the roof. It is also a suggestion of how tall larger stupas - like the Thuparamaya - might have been when they were originally built, and before later restorations made them taller than their vatadage columns. The three image houses to the west of the Medirigiriya Vatadage are not very well preserved, the remains of their walls rising just a few inches above the ground and with remnants of the statues. The Pichcha Mal Viharaya is easily the best preserved of the image houses. It is also the largest. It's five exquisite Buddhas give the ruin a tranquillity that makes one want to sit and reflect on the motives, beliefs, and sheer craftsmanship of Medirigiriya's builders. In fact, it is not uncommon to see visitors praying and reciting Buddhist verses; particularly on Poya days. Medirigiriya is most easily accessed from Minneriya or Giritale; the last part along a pretty country road through paddy fields, following a broad green canal. 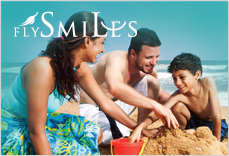 It is a quick detour for anyone travelling to Polonnaruwa, and it is time well spent. 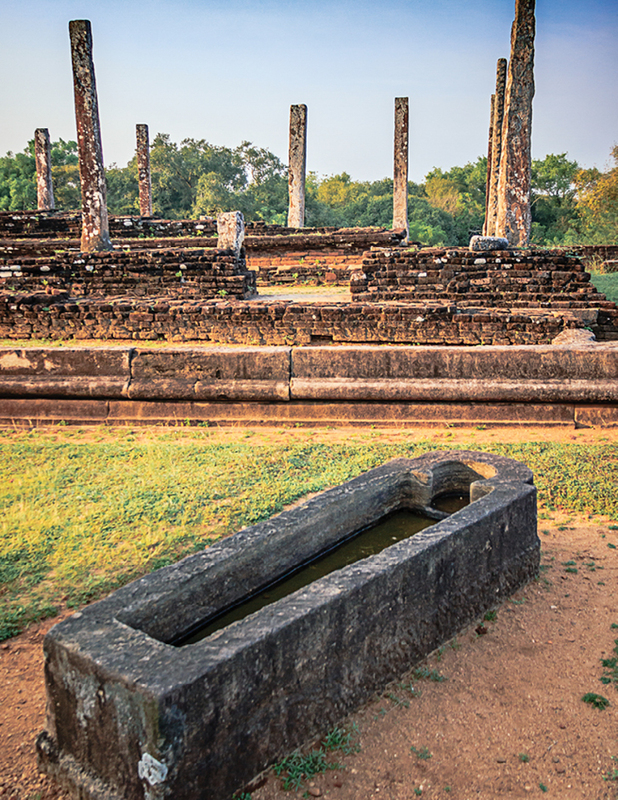 The Polonnaruwa Vatadage may be far better preserved, but Medirigiriya is half a thousand years older, and arguably the best existing example of its type from the Anuradhapura period.